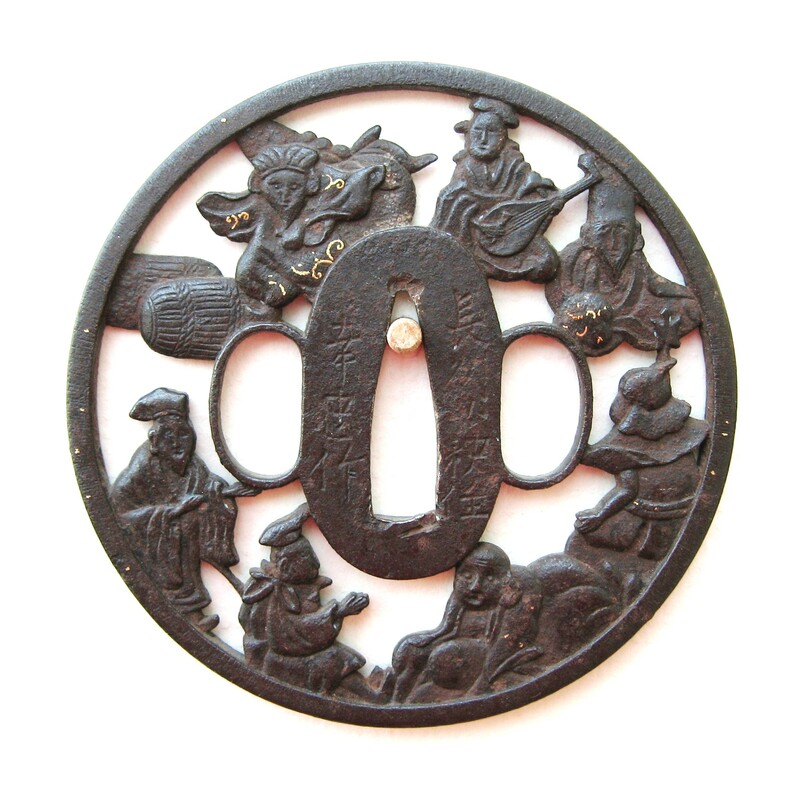 A round iron tsuba with the SHICHIFUKUJIN (Seven Gods of Good Fortune) in openwork relief. The gold inlay was done sparringly, it appears to be intact. The square rim shows excellant file work on the edges in amida form. The Shichifukujin are an eclectic group of deities from Japan, India, and China. Only one god is native to Japan (Ebisu) and Japan's indigenous Shinto tradition. Three are from the Hindu-Buddhist pantheon of India (Daikokuten, Bishamonten, and Benzaiten) and three from Chinese Taoist-Buddhist traditions (Hotei, Juroujin, and Fukurokuju). In Japan, they travel together on their treasure ship (takara bune) and dispense happiness to believers. Each deity existed independently before Japan's "artificial" creation of the group in the 17th century. EBISU. The god of fishermen and good fortune, the smiling and bearded Ebisu is most often depicted dressed as a Japanese peasant with a fishing rod in his right hand, and with a large red sea bream (Jp. = tai) dangling from the line or tucked under his left arm. In Japan, this fish (sea bream or red snapper) is a symbol of good forture. Sometimes Ebisu is also carrying a folding fan, and shown wearing a tall pointed hat. I'm not sure what these latter two objects mean, although the folding fan was waved by the emperor in a certain direction to indicate either acceptance or rejection of a request during the emperor's audiences with nobles and commoners. It might therefore represent the granting of wishes. In a nation very fond of fish, Ebisu is not surprisingly one of the most popular of the Seven Lucky Gods. Ebisu is also the only deity among the seven to originate in Japan. Today he symbolizes not only safe sailing and plentiful fishing, but business prosperity for merchants in all trades. In artwork, Ebisu is often paired with Daikoku (Hindu origin; god of agriculture & rice). 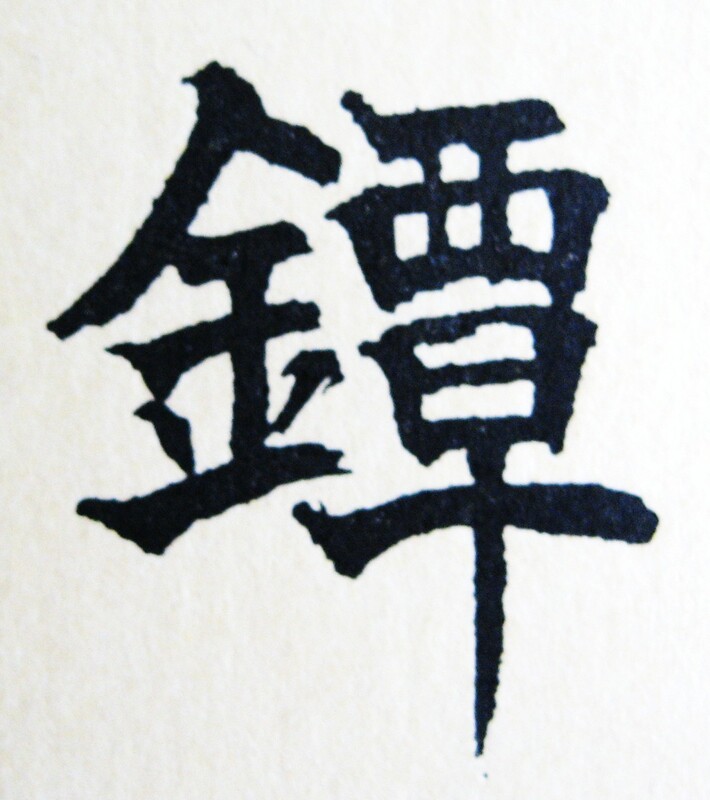 Indeed, in some traditions, Ebisu is considered the son of Daikoku. 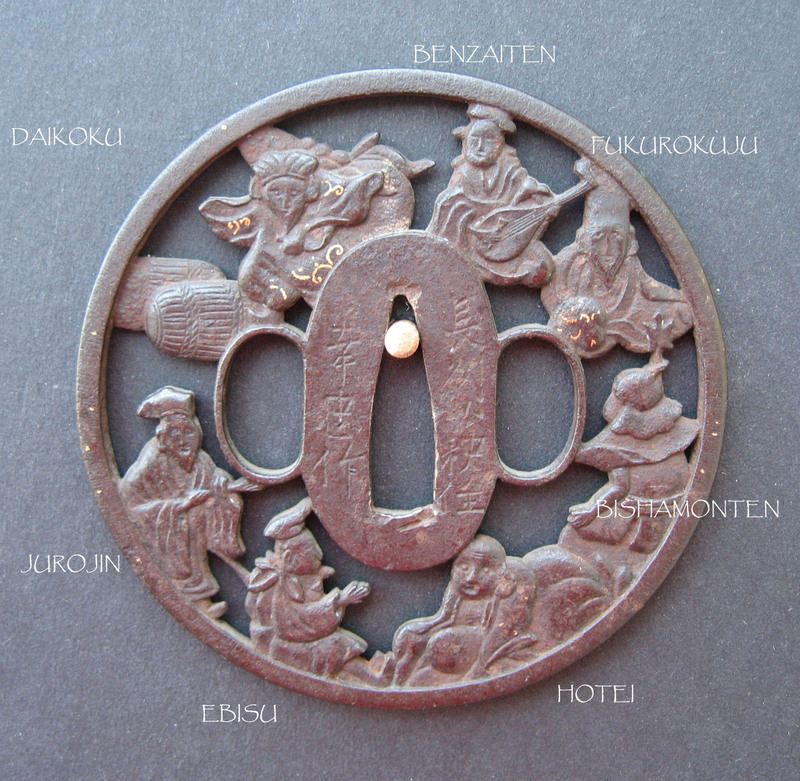 Together with the seven, the Ebisu-Daikoku duet is perhaps the most popular motif of good luck nationwide. BENZAITEN. A river goddess in Indian mythology. Her Sanskrit name "Sarasvati" means "flowing water" and thus she represents everything that flows (e.g., music, words, speech, eloquence). Later adopted into the Buddhist and then Shinto pantheons of Japan. One of Japan's Seven Lucky Gods. Comes in two main forms: (1) with two arms holding a lute; (2) with eight arms holding martial implements to indicate her role as protector against disaster; this version is called Happi Benzaiten. In less-common forms she is depicted naked or as Uga Benzaiten (esoteric form). Her messenger is the snake, so she is sometimes shown mounted on a serpent or dragon. Benzaiten is the sole female among the Seven Lucky Gods of Japan. Her temples and shrines are almost invariably in the neighborhood of water -- the sea, a river, or a pond. She is the patroness of music, the fine arts (dancing, acting, visual), and good fortune in general, and is often shown carrying a biwa (Japanese mandolin) or playing a lute. She is often represented as a beautiful woman with the power to assume the form of a serpent, or shown seated on a dragon or serpent and playing a lute. In fact, the snake is almost always associated with Benzaiten, who was originally a Hindu deity (Sarasvati) who represented learning, music and poetry. Such artistic learning and wisdom often bring prosperity, hence her inclusion in the Japanese group of seven luckies. She also has a jewel that grants desires. Some say it is a jade, while others say it is a pearl. In India, her birthplace, she is called Sarasvati (literally "flowing water"), which is the name of an actual Indian river. She is thus a Goddess of the River. She arrived in Japan soon after the introduction of Buddhism to this island in the 6th century, and her worship was based largely on her attributes as described in the Sutra of Golden Light as translated into Chinese by Yijing in the 7th century. This sutra is regarded primarily as a scripture for state protection, wherein Benzaiten is described with eight arms that hold protective martial instruments including the bow, arrow, sword, ax, spear, long pestle, iron wheel, and silk rope. BISHAMONTEN. The god of war and warriors, and a dispenser of wealth and good fortune. Bishamonten is also considered a god of healing, with the power to save emperors from life-threatening illness and to expel the demons of plague. Bishamonten is usually clad in armor, with a spear in one hand and a pagoda in the other. He is the scourge of evil doers, and the most powerful among the Guardians of the Four Directions (Jp. = Shitenno; Skt. = Lokapala), who he commands. When portrayed among the Shitenno, he is known as Tamonten. Among the four, he alone is worshipped independently in Japan. He is also one of Japan's Seven Lucky Gods. Bishamon's name in Sanskrit is Vaishravana, which means "one who hears everything in the kingdom." It is very likely that his imagery and iconography originated with the Hindu deity named Kubera / Kuvera. The small pagoda he often carries symbolizes the divine treasure house. He is both a protector of and dispenser of its treasure -- he shares the pagoda's vast treasures with only "the worthy." In Japan, as a member of the Four Heavenly Kings, he is called Tamonten (Listens to Many Teachings), and in this capacity he protects the places where Buddha preaches and listens always to Buddha's teachings. Said to live halfway down the north side of Mount Sumeru, Bishamon/Tamonten protects the north, and commands two classes of mythical spirits and demons -- the Yasha (Yaksa) and the Rasetsu (Raksha). FUKUROKUJU. The god of wisdom, wealth, and longevity, the bearded Fukurokuju has an unusually high forehead, and is typically holding a cane with a sutra scroll (hebi) attached to it. He may also have a tortoise or crane near him (both creatures are signs of longevity in China and Japan). Fukurokuju probably originated from an old Chinese tale about a mythical Taoist Chinese hermit sage (Sung Period) renowned for performing miracles. In China, this hermit was considered to embody the celestial powers of the south polar star (Southern Cross). To some, the scroll is thought to contain all the wisdom of the world, while to others it contains a magical scripture. Often associated with or confused with Juroujin. The two are said to inhabit the same body and share similar iconography. Fukurokuju is sometimes shown with a drinking vessel (tokkuri) in his left hand, but this is most likely a mistake, for it is Juroujin (not Fukurokuju) who is considered a lover of rice wine (sake). JUROUJIN. The god of longevity, Juroujin (also spelled Jurōjin or Jurojin) is another god from China's Taoist pantheon. Depicted as an old man with a long white beard, he carries a holy staff with a scroll tied to it, on which is written the life span of all living things. The deer, a symbol of longevity, usually (but not always) accompanies him as a messenger, as do other long-lived animals such as the stag, crane and tortoise. Jurojin is often identified with Fukurokuju. In some traditions, the two are said to inhabit the same body. HOTEI. The god of contentment and happiness, Hotei has a cheerful face and a big belly. He is supposedly based on an actual person, and is widely recognized outside of Japan. He carries a large cloth bag over his back, one that never empties, for he uses it to feed the poor and needy. Indeed, the Japanese spelling of "Ho Tei" literally means "cloth bag." He also holds a Chinese fan called an oogi (said to be a "wish giving" fan -- in the distant past, this type of fan was used by the aristocracy to indicate to vassals that their requests would be granted). Hotei is most likely based on the itinerant 10th-century Chinese Buddhist monk and hermit Budaishi (d. 917), who is said to be an incarnation of Miroku Bodhisattva (Maitreya in Sanskrit). Hotei is sometimes shown surrounded by a group of small children, romping and squealing in delight around his rotund shape. In recent times, Hotei is also referred to as the patron saint of restaurateurs and bartenders. When one over eats and over drinks, one may sometimes jokingly attribute it to Hotei's influence. DAIKOKU. Since the 17th century, Daikoku has been most widely known as the Japanese god of wealth and farmers, although in earlier centuries he was considered a fierce protector deity. In Japan, artwork of this deity usually shows him wearing a hood and standing on bales of rice, carrying a large sack of treasure slung over his shoulder and holding a small magic mallet. There are other forms, including a female form, but in Japan, the god is invariably shown standing on two bales of rice holding his magic mallet and treasure sack. In some traditions, Daikoku is also considered a deity of the kitchen and a provider of food, and images of him can still be found in monastery kitchens and in the kitchens of private homes. Of Indian origin, Daikoku imagery in Japan is identified with the mythic Shinto figure Oo-kuninushi-no-Mikoto (or Okuninushi-no-Kami, translated as "Prince Plenty"). 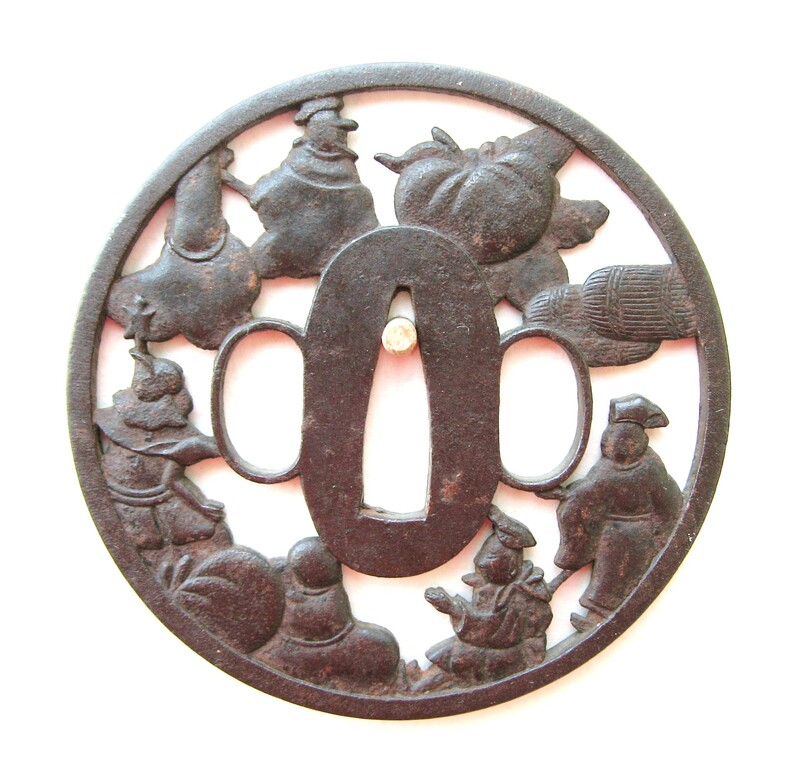 The lucky mallet in his right hand (uchide nokozuchi) is similar to the Greek cornucopia. This horn of plenty can magically produce anything desired when struck. Some Japanese say that coins fall out when he shakes his mallet. Others say that believers are granted their desires by tapping a symbolic mallet on the ground three times and making a wish. Daikoku is often depicted together with Ebisu, as the two are considered father (Daikoku) and son (Ebisu), although sometimes the two are thought to be brothers. The symbol of the Precious Buddhist Jewel (Skt. 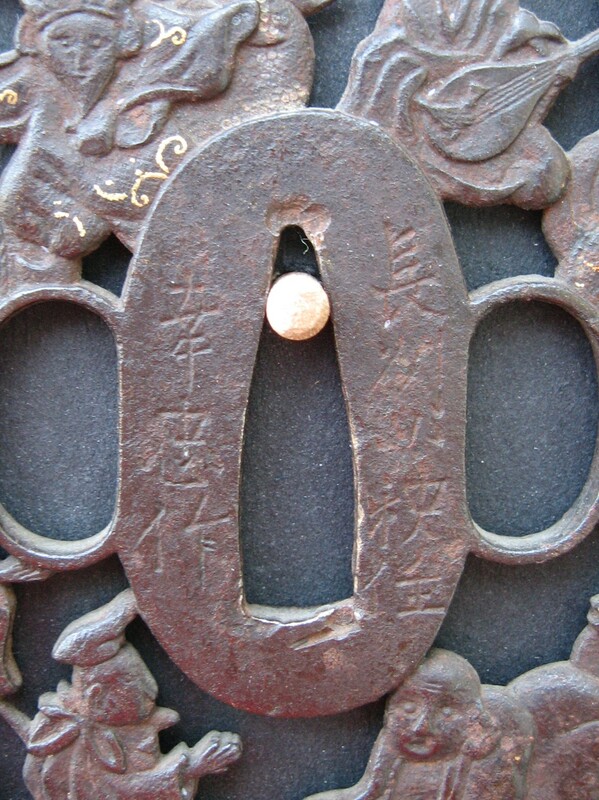 cintamani; the "wish-granting jewel"), sometimes found on Daikoku's mallet or belt, represents the themes of wealth and unfolding possibility; said to give its holder the ability to see all things (like a crystal ball). The precious jewel is one of the seven symbols of royal power in Buddhism.